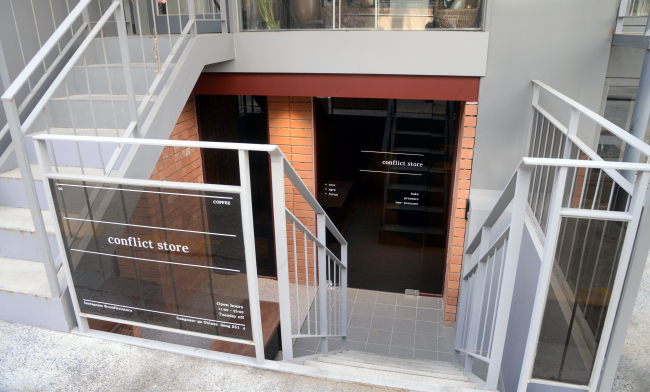 In many ways, the word “conflict” is at odds with the actual concept of barista Park Jin-hoon’s new spot. “I do not want competition between roasters, I want to promote communication,” said Conflict Store owner Park, 33, who wants his cafe to be a level field by spotlighting multiple roasters instead of one in his space. In essence, the use of the word “conflict” is meant to be ironic. Little else is ironic at this uber-serious hangout, which is quickly attracting cafe-goers a little over a month after opening near Sinsa-dong’s Garosugil. From a half-underground space of red brick pillars, warm wood accents and vintage JBL 65 speakers, Park brews and extracts coffee, espresso and other coffee-based drinks from a selection of roasters’ beans. 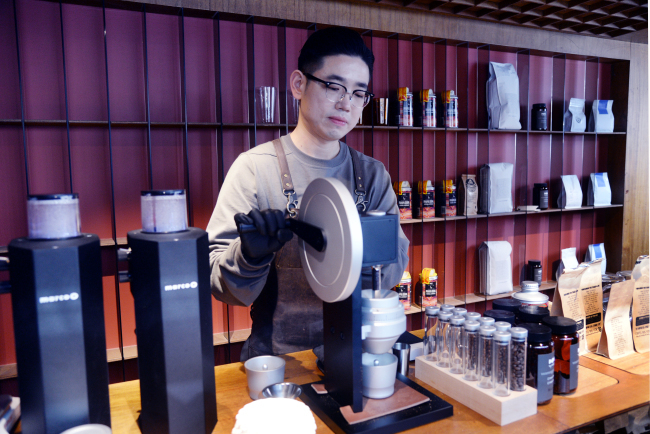 To make it easier for cafe-goers to decide on a roaster, Park has carefully arranged placards detailing each roaster’s beans, including his own flavor profile percentages for bitterness, sweetness and acidity. At the moment, Park offers beans from six local and overseas roasters. His criteria for making it to his shortlist are relatively straightforward, including that there is no overlap in the type of roasting machine used by each roaster. 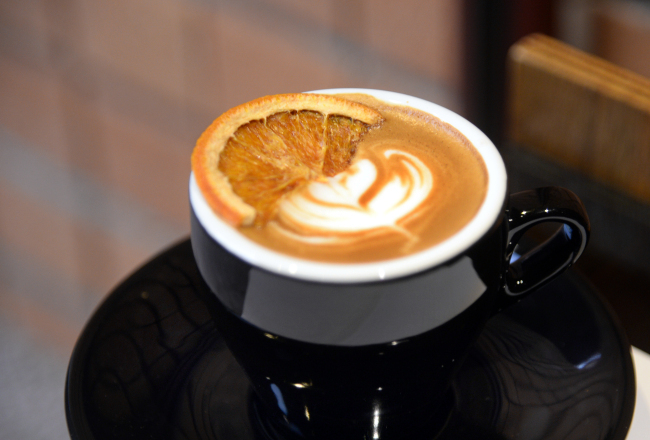 “I add amaretto syrup,” said Park, who then adds a double shot of espresso and tops it with microfoam before garnishing the whole affair with half a slice of dried orange. Park’s “Citrico” tastes like biscotti in a cup, beautiful notes of bitter almond, toast, vanilla and dark chocolate all rolled into one. The cortado is equally good -- an equal proportion of coffee to milk, which is a double shot of espresso and microfoam. The resulting brew is creamy and bitter and intense, with hints of smoke and caramel. The microfoam is perfectly dense, near silken in texture with a heft that complements the richness of the espresso. Park’s skills as a barista and coffee curator come from eight years of experience, during which he delved into roasting, cupping and extracting coffee. Now all that comes together at this small 25-seat space, already inundated with cafe-goers who are busy taking snaps of the photogenic space, selfies and high resolution shots of Park’s coffee.